Any Sword & Sorcery that has inspirations from Egypt or fantasy versions of it (i.e. REH's Stygia) are fair game. Lot's of good possibilities here, as supporting discussion revealed (thanks to Stan, Joseph, and Jack for guiding that). The initial Zebra books of the 1980’s essential split one long novel into a trilogy (I suspect the split was arbitrary). T.C. Rypel’s 1980 series has been released in a more complete forms (more books, eBooks, audiobooks). The newer releases from Borgo Press seem to have maintained this split. Thaumaturgy is associated with deep incantation of magic, and Tom Barczak is an expert at such language-delivered-necromancy. I had the pleasure of interviewing him on the topic of Beauty in Weird fiction. Weird fiction pioneer Clark Ashton Smith once wrote: "My own conscious ideal has been to delude the reader into accepting an impossibility, or series of impossibilities, by means of a sort of verbal black magic, in the achievement of which I make use of prose-rhythm, metaphor, simile, tone-color, counter-point, and other stylistic resources, like a sort of incantation." "A little boy stared back at him with living eyes. Dark, deep, and soul filled eyes, eyes that hadn’t begun to carry the scars of the loss of everything around them, eyes that didn’t hide behind a veil, behind a promise made to be broken. His eyes were familiar. The boy’s eyes weren’t afraid. They were hungry. Talus threw himself backwards, fumbling with his cloak. He thrust the small blade of his trembling knife towards the boy. The new light of day settled upon it like blood. The boy scrambled away, but his dark eyes held like ice. He raised his hand to a growing red scar just let upon his cheek. A supplicant’s smile stretched his lips. He placed the back of his hand against his face." There are six short stories in the Awakening, a set that is a prequel to Veil of the Dragon (which I enjoyed of course). They are very short... but the amount of impact per word is very high. This type of work is best served in limited doses (i.e. like espresso). Unpolished illustrations from the author are a nice touch; they are fitting since the author is an artists/architect, but they are bonus material to complement the experience. The Awakening Evarun is highly recommended. The Hour of the Dragon - Howard's only Conan Novel review by S.E. The Hour of the Dragon (1934-1936), is Robert E. Howard''s only full length novel of Conan, the barbarian he popularized in short story form. The text is available on-line for free via the Gutenberg project, but there are reason's to track down a paperback. I read the Berkley Putnam 1977 edition, which has splendid additions to the story: comprehensive foreword and afterwords by Karl Wagner explain how the novel formed prior being serialized in Weird Tales; a map of the Hyborian Age (inspired by REH's own drawings) is essential for the Hyborian ambiances; interior illustrations are bonuses; and cover art by Ken Kelly is stellar. Hyborian Age: As Wagner details, this book was REH's attempt to break into the UK market that demanded novels (and were not agreeable to his proposals for a collection of his own stories). REH presents Conan as King of Aquilonia. Sorcery and treachery dethrone him, and Conan trots about much of Hyboria, either pursing or being challenged by those who have the magical Heart of Ahriman (which we learn in the opening chapter). This touring of the pre-drowned Euro-Afro-Asia continent begs for a map. 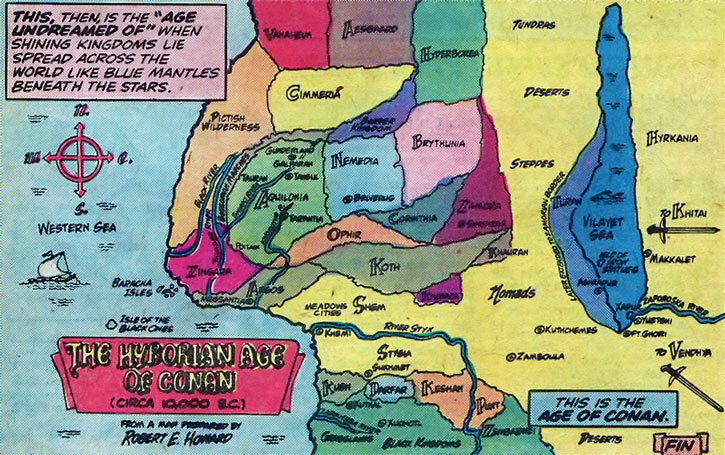 The traveling adventure amplifies the Hyborian Age concept; REH's Conan lived in rich pseudo historical land that enabled real ancient cultures to interact with mythical ones. Each chapter has Conan (and his enemies) traversing Aquilonia, Nemeda, Argos, Stygia, and more (these roughly translates to central Europe and Northern Africa). Missing Chapter Mystery: A deal was accepted but the UK publisher went belly up, so REH worked with Weird Tales to publish the chapters in serial form. As Wagner explains, there is a possibility that one chapter went missing (#20). Wagner left the numbering of the chapters consistent with the numbering as printed in Weird Tales (#20 is skipped); the original manuscript sent to Denis Archer has 4,000 more words (Pawling & Ness imprint) has 75,000 words. That edition never made it to press, but Weird Tales published the novel in serial form...and it had only 71,000 words. Regardless, the story seems consistent, so there is no obvious loss in plot. Example 1: Concubine saves Conan and is glad to have him put a knife to her "Walk beside me," [Conan] instructed her softly, passing his massive arm about her lithe waist. "You've played me fair so far, and I'm inclined to believe in you; but I've lived this long only because I've trusted no one too far, man or woman. So! Now if you play me false you won't live to enjoy the jest." She did not flinch at sight of the reddened poniard or the contact of his hard muscles about her supple body. "Cut me down without mercy if I play you false," she answered. "The very feel of your arm about me, even in menace, is as the fulfillment of a dream." Example 2: Conan relishes in his obvious manliness "All right," [Conan] muttered. "I'll trust you; though, by Crom, the habits of a lifetime are not easily put aside. Yet I wouldn't harm you now, if you brought all the swordsmen in Nemedia upon me. But for you Tarascus's cursed ape would have come upon me in chains and unarmed. Do as you wish, girl." Kissing his hands, she sprang lithely up and ran down the corridor, to vanish through a heavy double door. He glanced after her, wondering if he was a fool to trust her; then he shrugged his mighty shoulders and pulled the satin hangings together, masking his refuge. It was not strange that a passionate young beauty should be risking her life to aid him; such things had happened often enough in his life. Many women had looked on him with favor, in the days of his wanderings, and in the time of his kingship. Example 3: Conan thanks the concubine who saves him by taking his sexual due "A horse is hidden for you in a thicket beside the road that runs westward, a few hundred paces to the south of the fountain of Thrallos. You know where it is?" "Aye! But what of you? I had meant to take you with me." A flood of joy lighted her beautiful face. "Then my cup of happiness is brimming! But I will not hamper your escape. Burdened with me you would fail. Nay, do not fear for me. They will never suspect that I aided you willingly. Go! What you have just said will glorify my life throughout the long years." He caught her up in his iron arms, crushed her slim, vibrant figure to him and kissed her fiercely on eyes, cheeks, throat and lips, until she lay panting in his embrace; gusty and tempestuous as a storm-wind, even his love- making was violent. The over arching plot is engaging, as is Conan's adventures as he meets up with past friends/foes/allies of his pre-King days. The titular Dragon refers to the antagonist's standard (there are many other bad guys, often associated with serpents); Conan and his allies have Lion icons. Conan is dethroned in the very beginning, and it is nigh impossible not to read on to see how he can win it back. That said, the constant, intense adventure indicative of pulp fiction doesn't work well in a novel form. There is a chaotic, accumulating silliness: our "wilderness-bred", panther-stalking hero trips in a curtain while attacking his major foe; he routinely stumbles across key foes in random places, encounters that push any bounds of coincidence; he is saved too often by random characters/events; there are too many evil-dude-explains-his-ways scenes; every few pages he comes across new, crazy conflicts that would work well in short story form (ghouls, vampires, etc.). The in-your-face misogyny and high-frequency-chance-encounters/saves is distracting. The Hour of The Dragon is good adventure and represents Conan and REH's Hyboria well. The story is best when it focuses on the grand battles and weird descriptions of necromancy. A map and context (i.e. from Wagner's essays) make it more enjoyable. 2016/2017 Movie? : Seems like this may be the basis for the next Arnold movie of Conan (to be called Conan the Conqueror ...or King Conan). I could see that going really well.... or really poorly.